Dear everyone ~ at this point unfortunately I need to postpone these planned journeys to Mount Shasta because I need a visa to enter the USA and I don't know when I will be graced with one. I look very much forward to take people to this sacred place. Welcome to a Sacred Journey to Mount Shasta, California! We are planning to arrannge a trip Summer/ late Summer 2015. Please stay tuned! Dates Sept 25th~ Oct. 5th ~ 2014! 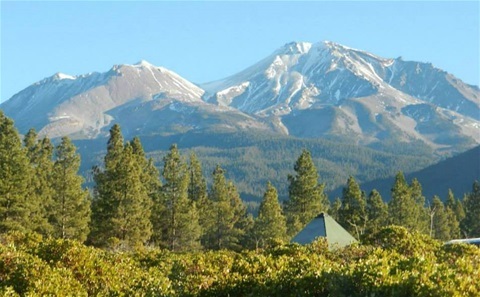 Mount Shasta is located in Northern California at the end of the Cascade Range in Siskiyou County. It is 4322 m high, or 14179 feet high, and the sccond highest peak in the Cascade Range. The oldest known human habitation in the area dates to about 7,000 years ago, and by about 5,000 years ago, there was substantial human habitation in the surrounding area.The peak is ranging 3000 meter above the rest of the landscape and stands there majestically, oftenwith snowy peaks! Mount Shasta is a very special place on earth; it represents much more than just a mere mountain. Mount Shasta can be considered as one of the most sacred places on this planet. The mountain is a mystic power source for this planet; actually, it is said that this sacred mountain is an incarnation of the Great Central Sun of this universe. It is a focus for angels, spirit-guides, spaceships, masters from the Light Realm, and the home of the survivors of Ancient Lemuria, which sank under the waves of the Pacific Ocean a little over 12,000 years ago. The mountain is well-known for its spiritual vortex, and it is of the greatest power spots on the planet. Travelers and energy sensitive people from all over the world come here to visit or stay a while, and take in the transformational energies of this area. Lenticular clouds, shadows and outstanding sunsets add to the mystical aura of the mountain. This is very interesting and there are many explanations about how and why these clouds appear there. Many people are drawn to this mountain, for variety of reasons. While staying there, many people experience the strong energies of the mountain and inner transformation. One seem to be able to heal many deep emotions while here. After a stay in the Shasta area one is never really the same, a huge growth in awareness often happens! I have seen many people return again and again to "be nourished". It is a place with pure high energies and a very good place for meditation and going deep within. In addition this area has amazingly beautiful nature! This combination makes this area perfect for a retreat! You will find huge waterfalls, rivers, caves, alpine flowers, special trees with lots of green moss, very beautiful and clear lakes and so on! There are several mountains around and the view from Mount Shasta is one of the most beautiful views I have seen...you will see blue mountains and the most amazing sunsets and sunrises.. This area certainly contains true natural beauty. There are many spiritual groups who have centres in the area. In addition one will find two organic groceries, a buddhist centre and yogacentre , crystal shops and much more.. It's a very special place on earth and abssolutely recommended a visit! We hope you will consider joining us! The Redwood trees are the home to the tallest and largest trees on Earth. Giant sequoias grow to an average height of 50–85 m (164–279 ft) and 6–8 m (20–26 ft) in diameter. Record trees have been measured to be 94.8 m (311 ft) in height and over 17 m (56 ft) in diameter. The oldest known giant sequoia based on ring count is 3,500 years old. Sequoia bark is fibrous, furrowed, and may be 90 cm (3.0 ft) thick at the base of the columnar trunk. It provides significant fire protection for the trees. The leaves are evergreen, awl-shaped, 3–6 millimetres (0.12–0.24 in) long, and arranged spirally on the shoots. The seed cones are 4–7 centimetres (1.6–2.8 in) long and mature in 18–20 months, though they typically remain green and closed for up to 20 years; each cone has 30–50 spirally arranged scales, with severalseeds on each scale, giving an average of 230 seeds per cone. Source: Wikipedia. They are in National Parks of the US, much of the in Northern California. The parks also protect vast prairies, oak woodlands, wild riverways, and nearly 40 miles of pristine coastline, all supporting a rich mosaic of wildlife diversity and cultural traditions. These are a "must- see" if one have the opportunity. So peaceful, big and beautiful! Wow! 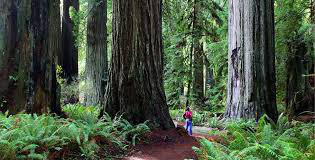 The trip will include a visit to the coastal redwoods of Northern California, near Eureka! These trees are well worth a visit once in a lifetime!! They carry a peace and long history you don't often find...!